St. Margaret’s service learning program builds in our students a culturally competent awareness of issues that face our local, regional, and global communities, nurtures empathy, and instills the courage and responsibility to take thoughtful action to improve the lives of others through deeper human connections. A pillar of our school’s mission is to educate students for lives of service. 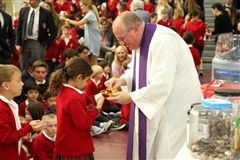 Our community believes that an essential outcome of St. Margaret’s education is that students and graduates feel the compassion, responsibility and calling to serve others and be active and contributing citizens within their communities and the world. 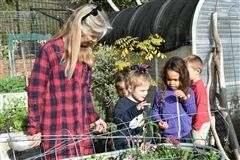 Our Episcopal identity guides our service learning program that focuses on empathy, understanding, compassion and activism, and begins with developmentally-appropriate activities in the preschool and builds through the Upper School years. Often the service experiences are tied to the content of our academic curriculum, making the service even more relevant and deepening the learning experience. Students have leveraged engineering skills to design and produce mechanical prosthetic hands for children in our EDGE Lab, traveled to the central coast of California to engage in drought reforestation actions as part of an AP environmental science, interviewed veterans and produced historical tributes in an grade 8 U.S. History, and organized relief efforts for the Nepal earthquakes as an extension of Model U.N. involvement among many other opportunities to learn and serve. We emphasize and model the importance of service by purposefully taking time in the school day within divisions and as an all-school community for service. St. Margaret’s also partners with several non-profit organizations and leverages these sustained relationships to further the missions of the non-profits and provide powerful learning experiences for our students, including Father Serra’s Pantry, The Ecology Center, Operation Help A Hero and the Camp Pendleton Marine Base, Families Assistance Ministries, Second Harvest Food Bank, The Friendship Shelter and Welcome Inn. The lessons of these kinds of hands-on service experiences leave students humbled, awestruck and with new understanding of issues and deep personal connections to the rewards of investing in and giving back to the community, making an impact, and yes, a difference. As our students graduate, they are keenly aware of the global and local needs that face our communities, and feel a sense of ownership, ability and responsibility to take action. St. Margaret’s graduates have gone on to stellar involvement with Teach for America, Habitat for Humanity, Global Works, and other organizations that catalyze service in communities near and far. We understand that these great things all stem from the importance of small things; developing understanding, nurturing compassion, and deepening curiosity. Students who think, care; and students who care, do something. 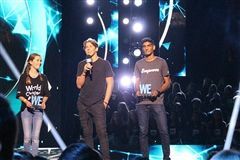 The ceremony included readings, music, a celebration of the Eucharist and the conclusion of the Literacy Day coin drive to help Californians impacted by wildfires. 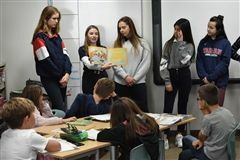 The day combines a celebration of reading, writing, speaking and listening with the launch of an all-school service learning initiative to help fellow Californians. 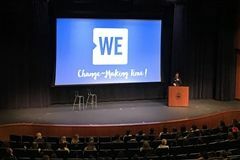 The event featured keynote speakers at Hurlbut Theater and breakout sessions across campus that inspired and empowered students to make positive changes in their community. 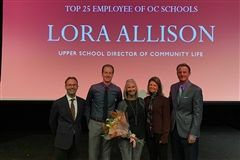 Mrs. Allison has been a visionary and key leader in revamping and innovating service learning at St. Margaret's. The village included items donated by the entire Lower School community, from pajamas and clothing to books and toys. The students are growing vegetables in the garden that will be harvested and donated to those in need. 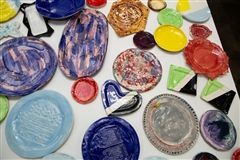 Students created more than 200 ceramic plates that were used to serve the local community. 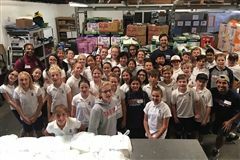 Middle School students left campus to lend time and effort to help the local community, while Lower School students learned more about service and its importance to the St. Margaret’s experience. 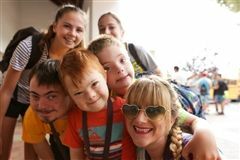 St. Margaret’s alumni joined more than 60 current St. Margaret’s Upper School students to serve at the day camp for children and teens with disabilities. St. Margaret’s is a designated WE school, and sponsors a WE Club in the Middle School and incorporates WE educational resources in multiple Upper School courses.